S L O W C R A W L ! Small, intimate groups will walk, crawl, or otherwise perambulate to each brewery to learn about each establishment’s philosophy and brewing process, beer styles, ingredients and many other aspects of local brewing. 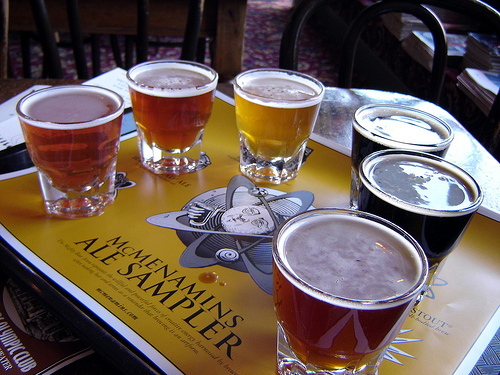 Participants will sample brews at each location. with appropriately paired beers accompanying each course. Tickets: Tickets will be available for sale from July 10 at Corvallis Brewing Supply. $20 for Slow Food USA members, $25 general public. A limited number of tickets will be available, and an early purchase will ensure you will be in the same group as your friends, so don’t be S L O W–crawl over to CBS for your tickets soon! If you have limited mobility, or just feel like taking a ride, call Corvallis Pedicab at 541 609 8949. Proceeds in excess of our costs will support Slow Food Corvallis’s programs to ensure good, clean, fair food for all. Please note that this is a related but SEPARATE event; separate tickets must be purchased in advance at Corvallis Brewing Supply. This three course dinner will feature casual local food paired with Block 15 Brews. Local greens, Willamette Valley Cheese Co. Aged Gouda, Craisins, Hazelnuts dressed with fresh herb vinagrette. Tickets for the Brewer’s Dinner are $30 and include all food, beverages, and gratuity. Tickets will be on sale at Corvallis Brewing Supply, and must be purchased in advance.